Happy Saturday Everyone and Happy World Card Making Day!!! Remember all products will be available tomorrow October 5th. To begin my card I first cut a white cardstock panel smaller than an A2 card then stamped the birch trees image from the Winter Woodland Stamp set and added some glitters for the snow. 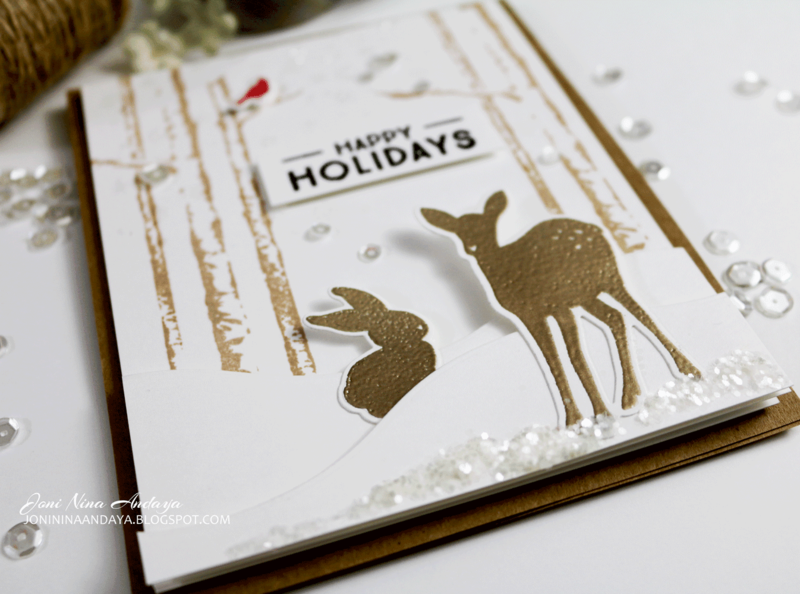 I then die-cut the Landscape Border dies to create a snowy slope for my deer and bunny then adhere on the card with dimensional foam adhesives. Next, I adhere the bunny and the deer also from the Winter Woodland stamp & dies on the slope with dimensional tape. I then added some more glitters at the bottom of the slope and Sparkling Clear Sequins from Pretty Pink Posh. 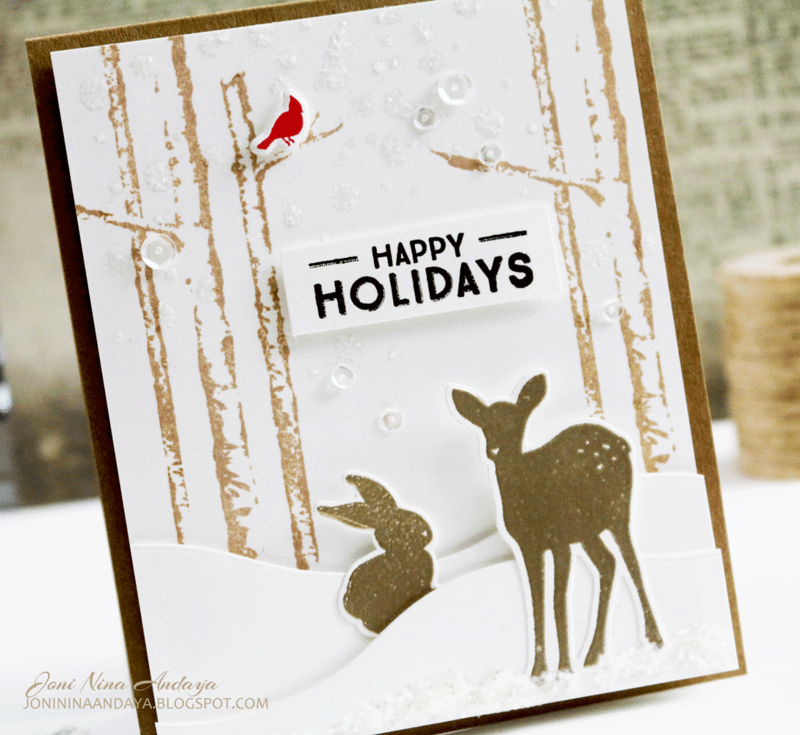 Finally I stamped the "Happy Holidays" sentiment also from the Winter Woodland stamp set on the strip of white cardstock and adhere on the card panel with foam tape to finish off the card. Here's the close-up of the layers. I hope you enjoyed this set! For more inspiration please stop by at Wplus9 Blog. Kara is also sharing some projects. This release is top notch! You rocked this card! Beautiful! LOVING the woodland critters!!!! Beautiful !! Love the new stamps ! Beautiful Falling snow and sequined atmosphere! What a gorgeous Card! Absolutely love the scene you created, just gorgeous! I am just loving this release !!! Your card is beautiful, this is such a great stamp set, a real must have !!!! Very pretty. I love the gentle snow drifts you created. Lovely! Your card is so beautiful and peaceful. I love all the layers and the sequins & glitter. So sweet Joni, love the pretty scene! Beauyiful!! Love the glitter and layers! Happy WCMD! Beautiful card Joni!!!! Happy world card making day! What a fabulous winter scene, Joni!